Stay on the water close to Hilo without staying downtown. Stay in a well landscaped home that is maintained to avoid mosquitos. Enjoy almost an acre across the street from Richardson’s Beach Park. One of the 7 stops of the Hop-on Hop-off bus tours. Enjoy the best snorkeling of east Big Island at your doorstep. Take out the kayak and learn to stand up paddle board. Two kayaks, stand up paddle board, surf board, boogie boards, 3 bikes and snorkel equipment provided free. NEED MORE SPACE? : Call us and ask about the upscale 3br/2ba beachfront house next door (www.vrbo.com/3948514ha). We also have another 3br3ba oceanfront house 5 doors down the street (www.vrbo.com/27643). Lastly, we have the newest house just 6 doors down the street (www.vrbo.com/4035464. Four bedroom, 3 baths that sleeps up to 15. I have 3 other homes just South of Hilo in Paradise Park that are on the water and very affordable. For current rates and availability on all our beachfront houses. •	East Hawaii’s best snorkeling across the street at Richardson’s Beach Park. •	Free Kayak, paddle board, bikes, boogie boards, snorkel equipment, booties. •	Full ocean views, outside seating, fruit trees, parking. •	Why settle for a house away from the water? This house is right across the street from Richardson’s Beach Park. Home of the best snorkeling in East Big Island. One of the 7 stops of the Hop-on Hop-off tours. Hilo offers few places to enjoy the ocean. These special places are always beach parks. 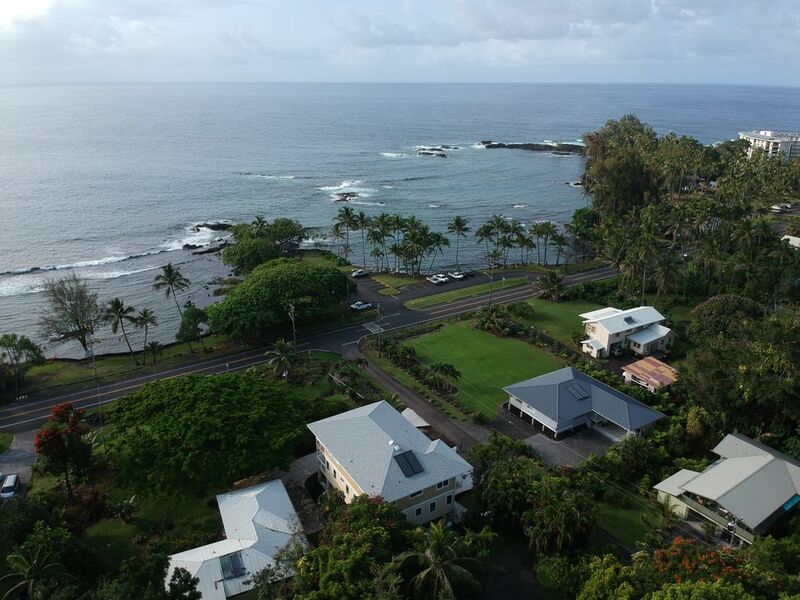 •	One of the nicest Hilo vacation rental homes in the area built to very high standards. •	House includes free use of Kayak, bikes, stand up paddle board, boogie boards, snorkel gear. •	House is completely stocked. Everything you need for cooking, plenty of towels, soap, shampoo, hair dryers. Ironing board/Iron, playpen, highchair and Cable Wifi. •	Living Room – Large couch and love seat with direct ocean views. Flat screen T.V. with Amazon Fire and Netflix for a huge selection of viewing options. Books and games for family fun. Cable Wifi. •	Kitchen – Everything you need. Coffee maker, blender, toaster, rice cooker, pots/pans. Lots of cooking tools. Large oven/range. View of Richardson’s Beach Park from kitchen window. •	Master Bedroom – Same level as main house with great ocean views. Private bathroom. Ceiling fan. •	Bedrooms #2: On the same level as master bedroom, living room and kitchen. Equiped with queen bed, night stand, ceiling fan, quality mattresses and linins. The bathroom is across the hall. All homes have play pens. •	Bedroom #3: The whole bottom level is bedroom 3 with its own bathroom. This room has a queen bed, two twin beds and a sofa sleeper. It has an additional couch. Access is from front of house. There is no internal staircase to upper floor, but steps to front door are right next to bedroom entrance. •	Master Bathroom: Dedicated to master bedroom. Large double headed shower with great garden views. Bright and modern. Bath towels, hand towels and wash cloths, hair dryer, shampoo and soap provided. •	Lower Bathroom: For lower level bedroom #3. Shower with shampoo, soaps and paper goods, towels, hair dryer provided. There is more to do in and around Hilo than any town on any of the Islands. It just isn’t well advertised because there aren’t resorts to promote the area. •	Gardens – Hawaiian Botanical Gardens, Lili’uokalani Park and Gardens, Nani Mau Gardens, Akatsuka Orchid Gardens. •	Museums – Lyman’s historical and geological museum and The Tsunami museum. Both in downtown Hilo. •	Beach Parks – Richardson’s Beach Park, Onekahakaha Beach Park (the calmest), Carlsmith Beach Park, Reed’s Bay, Lehia Park. Punalu’u Beach Park and Whittington Park. •	Volcanic sights: Volcano National Park, Thurston lava tube, Kaumana Caves State Park, Pahoa transfer station, Live lava bike/hike tours in Kalipana Viewing area. Why rent from me: Owner of 4 homes directly across from Richardson's beach park and 3 ocean front homes in paradise park. I manage these homes personally with my cell number available to all guests. Payments are handled through the security of the Homeaway/VRBO site. Guests also receive information on restaurants, shopping and my favorite places to visit. Unique benefits: If you plan on staying more than a couple days, you will have to enjoy the location. If you love the water and especially snorkeling, you will not find a better location. The best snorkeling is in just a few feet of water right in front of the black sand beach. It is like swimming in a tropical fish store. Green sea turtles come to rest for the night in the evening at the rocks just beyond the black sand beach. The water is largely sheltered by the rocks creating a partial lagoon. Yet this house is just down the street from downtown Hilo. Great for quick trips out to eat, shopping and many tourist locations. Review the "location" tab for a list of over 20 great places to see. Simply walk out your front door and across the small street. You can't get a closer house to the ocean and best snorkeling on this side of the Island. House overlooks Hilo Bay from most rooms. Ocean directly across the small street in front of house. Other homes offer ocean views - we are at the ocean where you can walk in an snorkel! Richardson's Beach Park is directly across the street. The black sand beach is a few doors down. Favorite location for sea turtles. Best snorkeling on this side of the Island. Amazon, Sling TV, HBO Go and many channels based on the Roku interface. Popular board games and puzzles. Beachfront, Oceanfront. Gourmet Kitchen with gas range, stainless appliances, granite, full privacy on 1 full acre lot, Oceanfront at the Beach, High speed Cable Internet Access,XBox with some games, Movie Library, Swimming gear, Boogie boards, 2 adult bicycles, Highest quality Linens provided. At the beach with lifeguard., Volcanoes National Park (30 minute drive), Imiloa Astronoly Center, University of Hawaii, Helicopter Tours, Starbucks Coffee. The home was large and met all of our needs. We all felt very comfortable. It was nice being able to do laundry. We enjoyed the toys available for snorkelling and playing in the water. We snorkeld with sea turtles right across the street! The home was much larger than expected and the pictures did not do it justice. We really enjoyed the nice porch as well. Would highly recommend! Great value vacation home! We had a lovely stay at this house. View was perfect. House was clean and in a beautiful setting. We drove through a short industrial side of town to get here, but it is a away from the hustle and bustle of town along a beach park lined strip. After spending a week in the Hilo area, and exploring the island, we were very happy we made this our home base for all our activities. We've stayed at many rental homes in many island settings and were happy to have the island feel this home gave us. From the waves and ocean view right across the street, to the birds singing outside our window, we loved it. I would recommend this home to anyone from couples to families. Thanks for accommodating us Richard. The Orchid house has a WOW factor- loved it! When we drove up, we were very happy that there was parking for both cars. Upon entering the house, we were happily surprised at how open and roomy the great room/kitchen seems. Speaking of the kitchen, we rent houses/condos because food allergies make restaurant dining difficult. I have never been in a kitchen so well equipped. Every gadget, pan, and knife you might need were there. These were quality knives which were sharp. The beds in the upstairs bedrooms were very comfortable and the fans in the rooms kept them at a great sleeping temperature. All of us loved going to sleep to the sounds of frogs and crickets. Two elementary school children and an 18 year old shared the downstairs. I can't attest to the comfort of the beds, but heard no complaints. They loved the privacy and the ability to "chill" without adults with them. They did use the fan provided, but did not feel that it was stuffy in there. All of us loved watching the geckos, especially the baby ones which appeared on the kitchen window screen every evening. I think it liked the air from the fan blowing on it. The kids also made great use of all the water toys provided. The kayak made going past the reef possible and the paddle boards made snorkeling more enjoyable for the one person not comfortable on her own. Overall, everyone had a great time. We did see some of the sights away from the house, but the snorkeling just a few doors down and the pool across the street with no waves and turtles was fantastic. There was no need to go elsewhere. We thought the KTA market was wonderful. The house had many beds so the kids each had their own. We were a large party and we all fit well into the house. We used the beach toys across the street for a once in a lifetime experience. We checked out the turtles each evening. Never were disappointed. Very close to town and everything there is to do. We also used the hilovacationhomes website he has to plan what to do. *Historic Downtown with shops and restaurants on the Bay. * Waterfalls right in town. Rainbow Falls and Boiling Pots. * Hawaiian Botanical Gardens.One of the nicest gardens you will find. * Hilo Farmers Market. Everyday but largest on Wednesday and Saturday. * Liliuckalani Gardens at Hilo Bay including Coconut Island. * Lyland museum for historic information and geologic rocks. * Hilo Zoo. Free and very pretty. * Mauna Loa Nut company self guided "look through window" tour and gift shop. Free and nice shop for lunch and ice cream. * Historic Palace Theatre downtown. Check internet for show dates. * Nearby to Pahoa town, near active lava flows. For up to 4 people, 2 to 6 days, $400/day.The weekly rate of $2,200 amounts to $315/day. For 5/6 people the rate for 2 to 6 days is $450/day. A week is $2,600, which is $371/day. For 7/8 people the rate for 2 to 6 days is $500/day. A week is $3,000, which is $429/day. For 9/10 people the rate for 2 to 6 days is $550/day. A week is $3,400, which is $486/day. For 11/12 - $600/day. Week is $3,800.